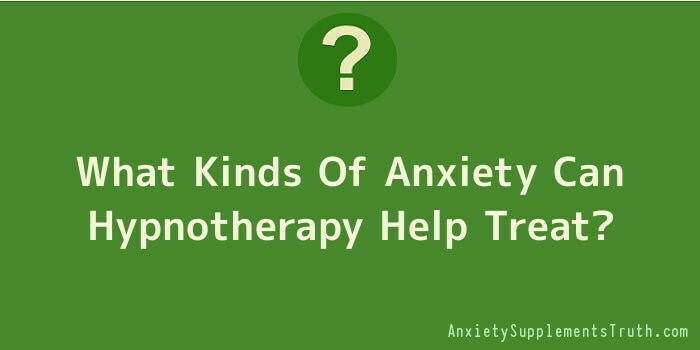 What Kinds Of Anxiety Can Hypnotherapy Help Treat? Anxiety is one of the by-products of living in a hectic and demanding modern world, where we are constantly bombarded with a huge number of things to worry about, whether it is making sure that we are earning enough at work to support our family, or handling a variety of offline and online social relationships. With many stress-inducing stimuli around us, it is no wonder that a large proportion of the population suffers with anxiety, whether temporary or chronic. Thankfully, there are a number of therapies that have been developed to treat this condition and return things to normal, and one of them is hypnotherapy. Although there has not, as yet, been a thorough review of the effectiveness of hypnotherapy for anxiety, it is a practice that many doctors will recommend, and one that has a great deal of anecdotal evidence backing it up. Hypnotherapy, for anxiety works by inducing a calm and peaceful state in the individual in question, which then allows them to access their innermost thoughts and beliefs. It is whilst in this hypnotised state that negative thought patterns causing anxiety can be identified and therefore rectified, leading to more positive behaviours in everyday life. One of the main anxiety disorders that individuals find themselves suffering with is Generalised Anxiety Disorder (GAD), which is where worries often spiral out of control and become extreme on a constant basis. People suffering with this debilitating condition can be overly concerned with everything from money and work to family and health. Those suffering from GAD find that their excessive worry severely affects their enjoyment of life, and are considered as having the disorder when these negative and stressful feelings last for longer than six months. Thankfully, hypnotherapy for anxiety is a potential solution for those with GAD. Another condition that hypnotherapy for anxiety can potentially help with is Panic Disorder, which is a condition that is characterised by feelings of sudden and overwhelming terror, sometimes resulting in panic attacks, which have many frightening physical symptoms such as shortness of breath, a rapid heartbeat and dizziness. With both GAD and Panic Disorder, hypnotherapy presents a way of getting to the core of the issues that are causing these conditions, as well as identifying the thought patterns that trigger the intense feelings of stress and terror that are felt. This therapy can therefore not only deal with the cause of the issue, but help put in place mental coping methods when the individual is triggered. Last but not least, another condition that hypnotherapy for anxiety can be effective for is Social Anxiety Disorder, which is characterised by extreme stress and discomfort when in social situations. This is an extremely wide spread condition, and according to some studies is the third most common psychiatric disorder after alcoholism and depression. A common sign of someone who is suffering with Social Anxiety Disorder is that they are afraid to be in the company of other people; they have a fear of interacting with other people, and finally, are afraid of being judged by other people. Hypnotherapy can be an appropriate method to deal with many anxiety disorders, as it seeks to get to the root cause of the issue instead of just treating the symptoms. As well as helping individuals deal with past events or negative thought patterns that cause their condition, it can also help develop more efficient coping methods which can greatly help in daily life. In addition to hypnosis, a treatment plan including Cognitive Behavioural Therapy (CBT) and medication may be recommended by the individual’s doctor in order to address all concerns, including debilitating symptoms, negative behaviours and root causes. It is therefore strongly recommended to seek your GP’s help if any anxiety disorder is affecting your enjoyment of life.